We had posted earlier about Bahria Town Karachi Overseas Block Booking and Payment Details but this topic require a separate post with details on how to book your property in the overseas block. Please read through the article and share in your social circle if this information has helped you. 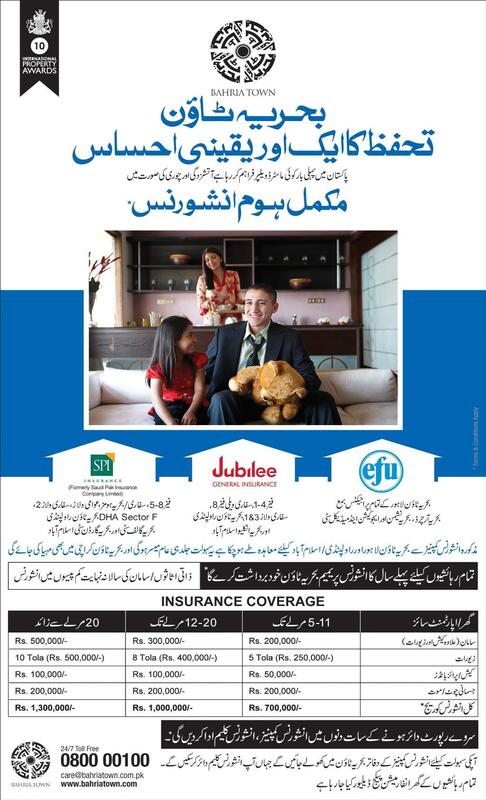 Overseas block is exclusively for the expatriate community of Pakistanis living abroad. Overseas community is considered to be the largest chunk of investors in property market of Pakistan. This block offers world-class infrastructure and facilities exclusively for Overseas Pakistanis. Our expat community is accustomed to the higher living standards in other countries, so they want the same facilities and luxuries in Pakistan. Bahria Town proudly offers the same international standards of luxuries in its Overseas blocks. Bahria Town has offered two sub-blocks in the overseas block. Lake View block is adjacent to a magnificent artificial lake. Living beside a beautiful lake is the idea you would feel like falling in love with. Just grab a piece of land on the bank of a beautiful lake and enjoy the luxuries of life you desire for your family. Golf Course Block comes with a USGA Standard Golf Course within the residential area. This block is ideal for those overseas Pakistanis who love playing Golf which is a standard sport enjoyed by most of the overseas families in the Western Countries. Note: Bahria Town offers special discounts on the application of membership of this Golf Course Block. If you love playing golf, you should just register yourself and get a discount which is not yet disclosed by Bahria Town Karachi. 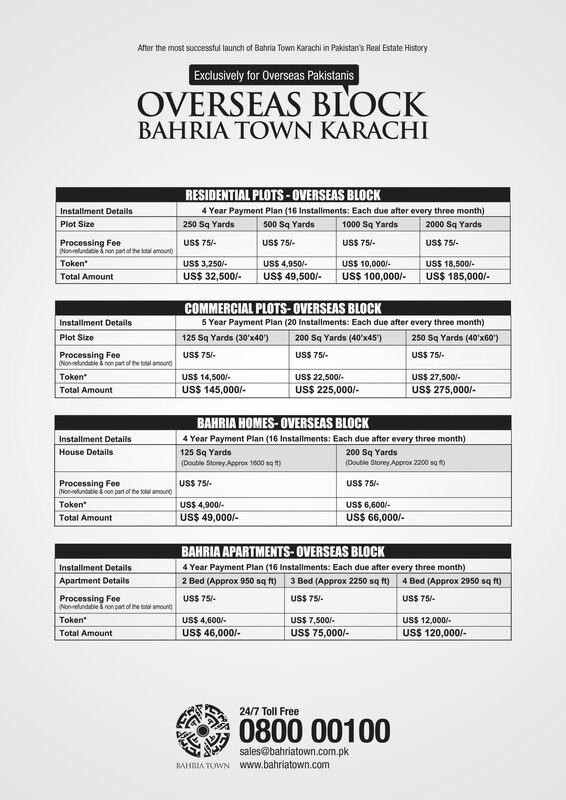 Bahria Town Overseas Block offers the following properties to the Expat Community. Please Note: Overseas block do not offer 125 Sq. Yards plot. Minimum available size is 10 marla for residential plots. Remaining properties are the same as offered in the previous launch. The booking starts from today (21-02-2014) and the last date for booking is 10-03-2014. The booking is offered at first come, first served basis. So it depends on how soon you can submit your application. You do not need to worry about balloting in this project launch, but you have to submit your application quickly. This is also the confirm booking for you if you act fast, so no need to go anywhere to get a confirm booking by paying extra money. If you fail to submit your application on time, you will not be able to get your applied-for property. In the case of failure, you will returned your down payment only. The 75$ processing fee is non-refundable. 1- You are required to have the status of an overseas Pakistan. You have to submit a copy of your work permit or Passport in order to prove that you are living and working abroad. 2- You need a booking form. Forms can be downloaded from Bahria Town Forms Website, where you have to give your details first before you can download the forms. Note: You do not need any registration form like old karachi registration form, hoshang pearl form, opal 225 form or other types of forms which were one of the prerequisites of the previous launch. 1- Just go the Bahria Town Forms Website, a contact form will open which requires you to enter your details. Just enter these details and follow procedure to download your required form. Note: If you want to book two or three properties, you have to download more booking forms from the given website, as a new serial number is generated each time you download a form and that is used for your application processing as well. Even if you want to book two residential plots, you will need to download two residential forms from the website. 2- Fill out the form with all the required details. 3- Attach 2 photos of yourself. 4- Attach CNICOP of yourself and your nominee. 5- Attach a copy of your work permit and a copy of your passport ID in order to prove your overseas status. 6- You have to pay 75$ processing fee (non-refundable) and the down payment for the required property. 6- Download This File for list of nationwide bank branches for submission of payment and form. Bahria Town gives details of selected bank branches across the country to facilitate the submission of applications. Nominated banks are HBL, UBL and NIB banks. 7- In case, you want to pay directly from abroad, you can Download This File for Bank Details for Telegraphic Transfer. The wire transfer is offered in EURO currency in Bahria Town Bank Account in Habib Bank Limited. 8- So you can pay directly to Bahria Town, attach receipt of your payment with your documents and send to any of Bahria Town Head Offices in Pakistan. Form submission will cost an extra 10$ for you. That is the cost of application form. See below the payment schedule for overseas block. The payment currency is USD ($), however Bahria Town has given you option to pay via wire transfer in Euro Currency. Prices are a little higher than the previous launch, but still it is worth spending a little higher as compared with the additional features and expected future value of overseas block properties. Should you require more information regarding booking procedure, please contact us using email or use our online chat feature to use our online support service.